(Dan Trimmer, 2002). Tetraploid (Celebration Of Angels x Tetraploid Ruffled Masterpiece) 22” EE Re Ev 5” PLUM BRANDY is one of the very first and also one of the last cultivars to bloom in the garden. This past year there were about 10 days where PLUM BRANDY was in bloom almost alone in the garden. When the season was just about completed on came another set of scapes! 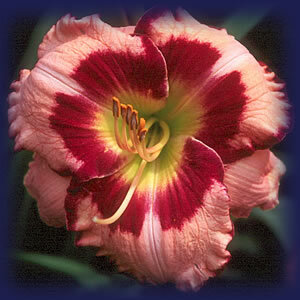 Fertile, bold eyed and edged with a bud count of 25-28 this colorful peach blend .